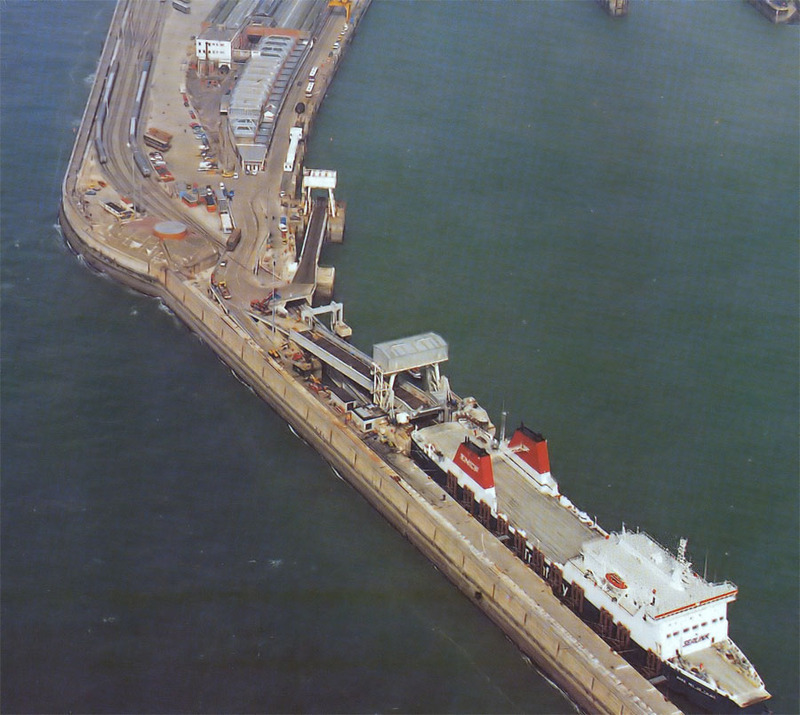 With ships becoming much larger only vessels built up to and before the early 1970’s could fit into the original train ferry dock situated within Dover’s Western Docks. The new generation of ships that were then being developed were twice the size in terms of size and capacity and they could make up to five round trips of the busy Dover Straits each day. 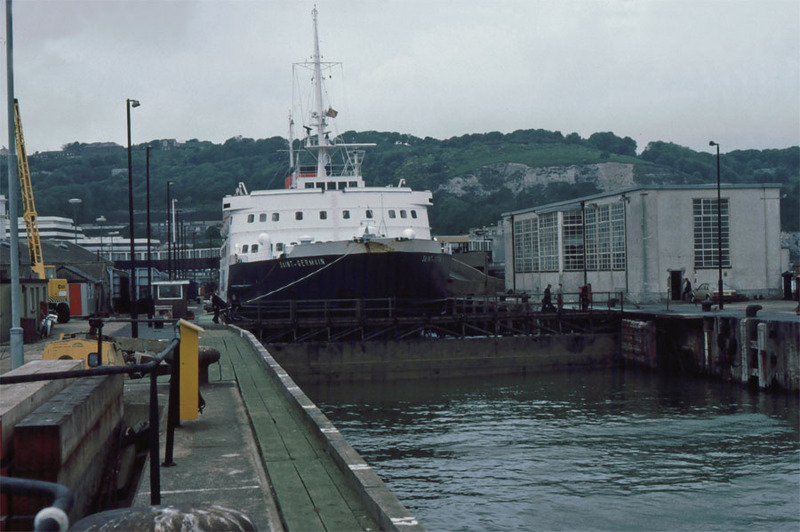 The train ferries that were in service at this time could only manage three round trips at best, this in part due to the time taken to adjust the water level within the train ferry dock to the sea level outside within the harbour. It was anticipated that the answer would be to build a berth large enough to take the biggest cross Channel ships. 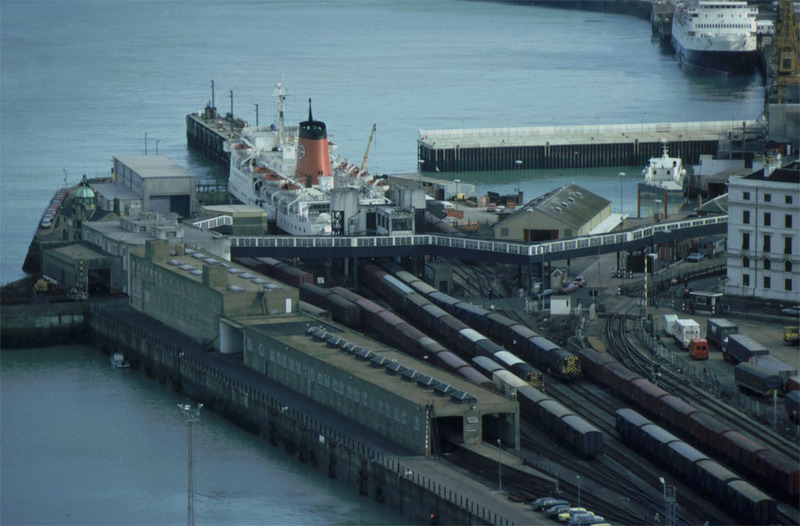 The new berth would be fitted with a linkspan long enough to follow the movement of the tide to enable ships to berth, load or discharge rail freight wagons at any state of the tide. 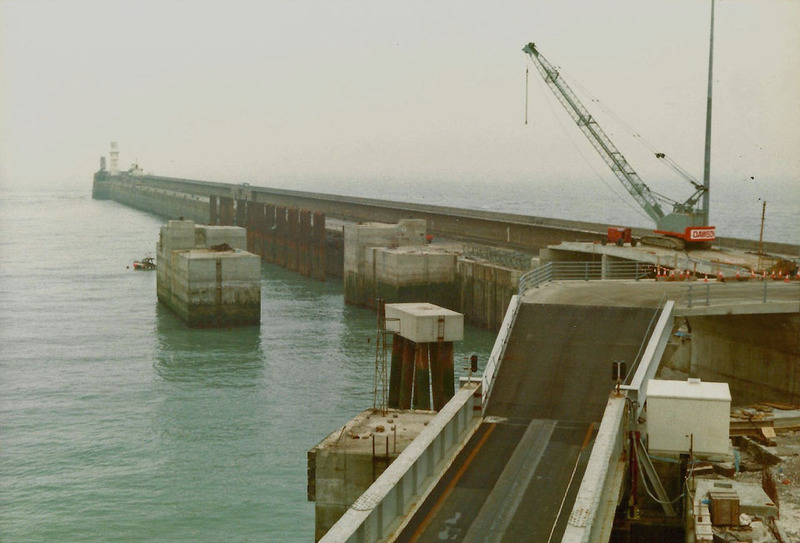 The lower linkspan bridge of the new berth actually measured 105m in length, almost double that of the other berths used elsewhere within the Port of Dover. 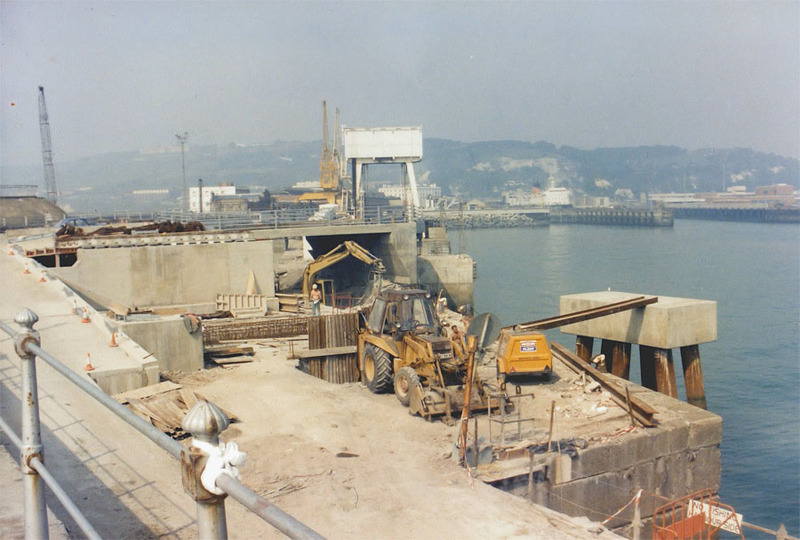 Following design and planning work the decision was finally made that between 1987/1988 the new Train Ferry Berth would be constructed on the Admiralty Pier extension. 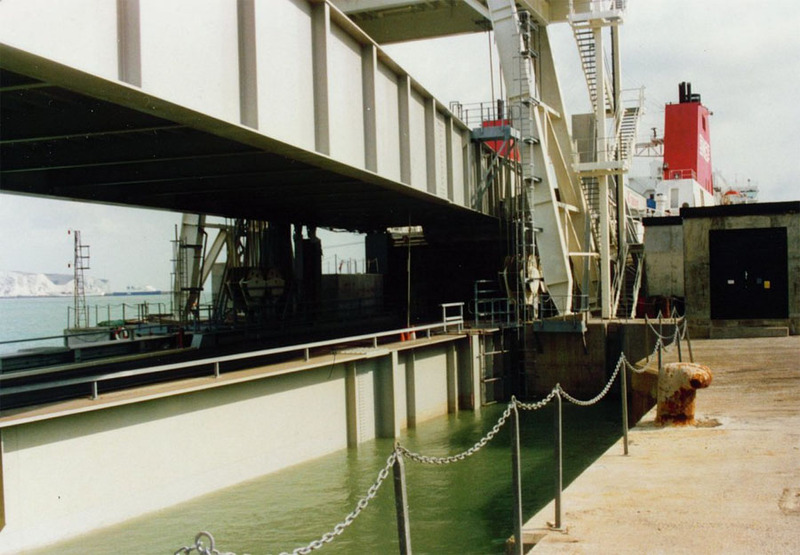 The new berth would be capable of taking vessels up to 160m in length and 23m in beam with rail traffic being loaded on the lower deck and RoRo freight vehicles on the upper deck. The estimated cost at 1986 prices was £8.9 million. With the design of the new berth finalised Sealink’s French partner Société Nationale des Chemin de Fer Francais (SNCF) ordered a new vessel from Chantiers du Nord et de la Méditerranée in Dunkirk, France. Built at a cost of £45 million Yard No 325 was christened as the NORD PAS DE CALAIS and was launched on the 15th April 1987. 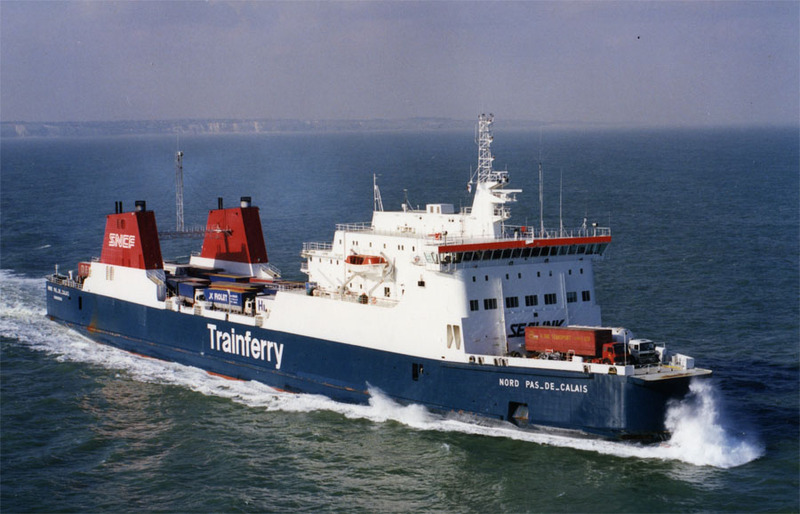 At 13,700 gross tons the new ferry would be the largest train ferry ever introduced on the cross-Channel service from Dunkerque to Dover. 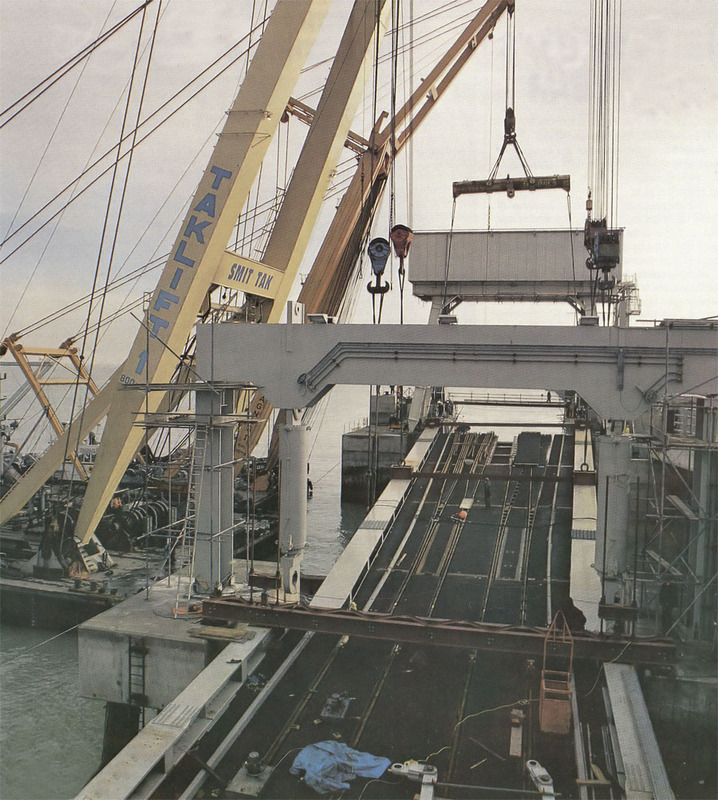 The highly automated train ferry was specially designed to use the new state of the art double deck computer controlled train ferry berth on the Admiralty Pier. 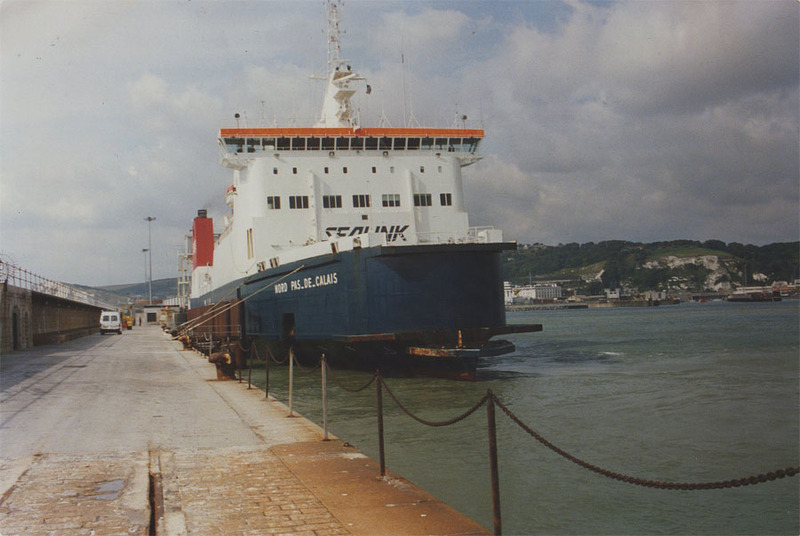 The vessel replaced the two smaller train ferries ST GERMAIN and ST ELOI and would make four round trips per day. 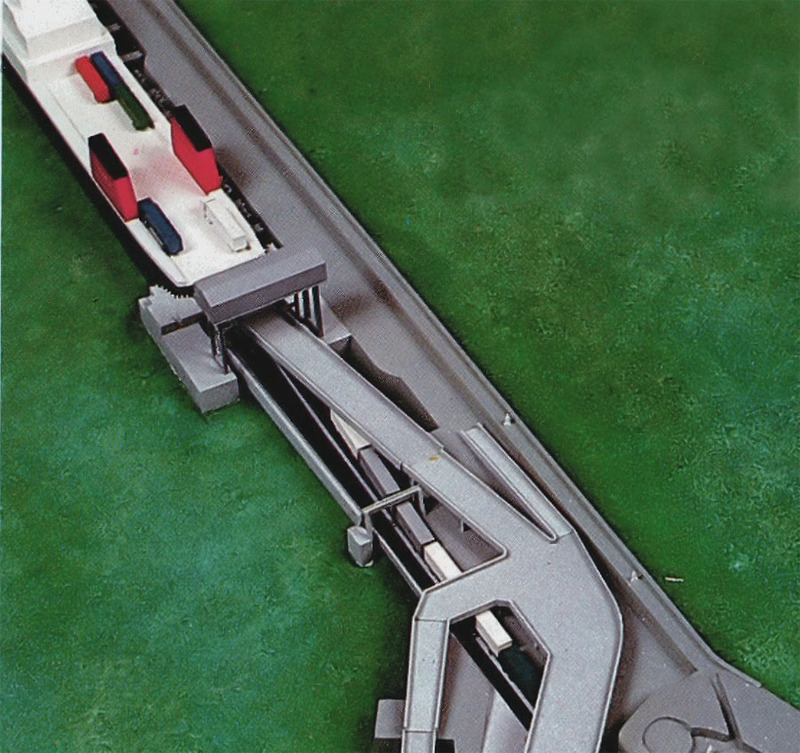 With 600m of rail track she was capable of carrying between 30 and 45 rail wagons per sailing allowing entire company trains of freight to be conveyed across the Channel. 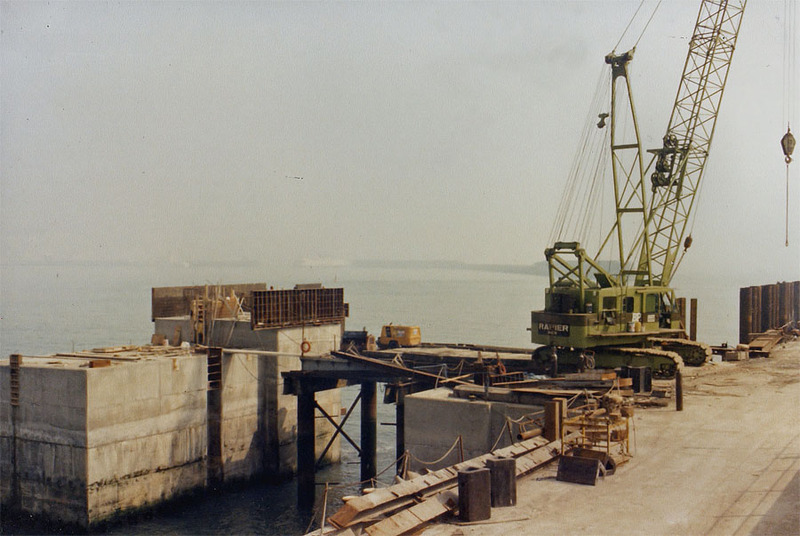 The portals and bridges were constructed at the import freight area within the Eastern Docks, where there was more room. 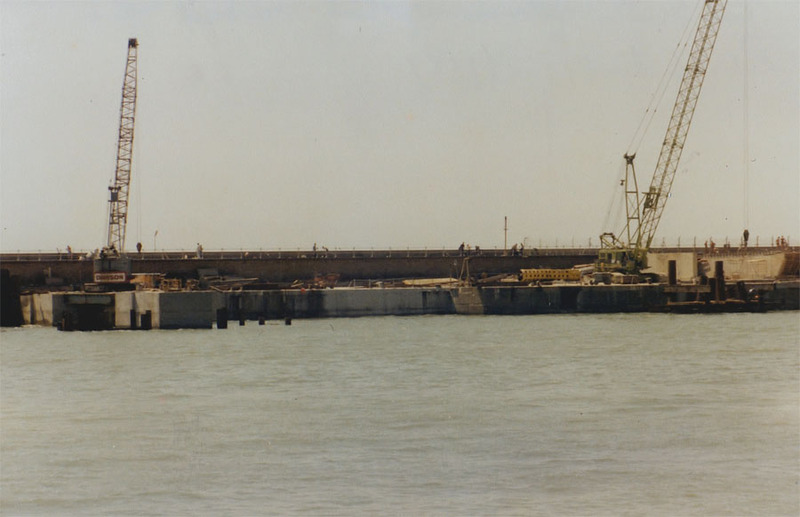 Once built they were lifted across the harbour by floating cranes in a delicate operation drawn out over several weeks because of adverse weather. The loading bridge and machinery, built by Cleveland Bridge, cost £4.6m and the associated sidings were constructed by British Rail for £0.35m. 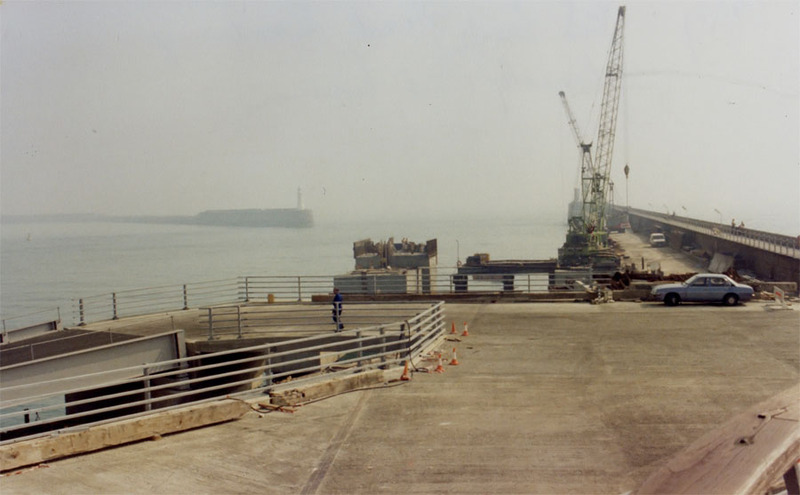 The new Dover – Dunkerque train ferry service was originally due to open in January 1988 but the “Great Storm” of October 1987 swept much of the construction plant into the harbour and destroyed the workings at the exposed Admiralty Pier site. 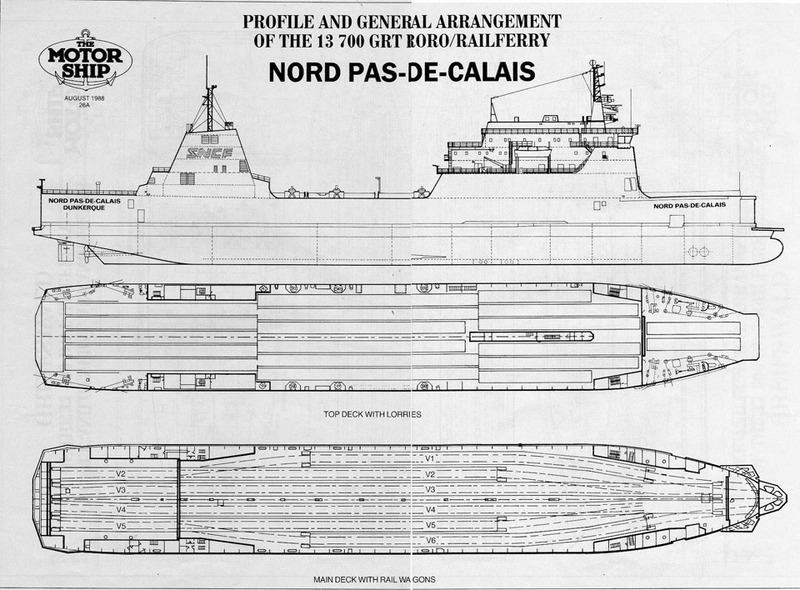 The NORD PAS DE CALAIS was actually delivered to SNCF in December 1987 and due to the delay caused by the “Great Storm” she initially entered service in a RoRo capacity conveying road freight between Calais and Dovers Eastern Docks, a true testament to her multipurpose design and a characteristic that would hold her in great demand well into the future. 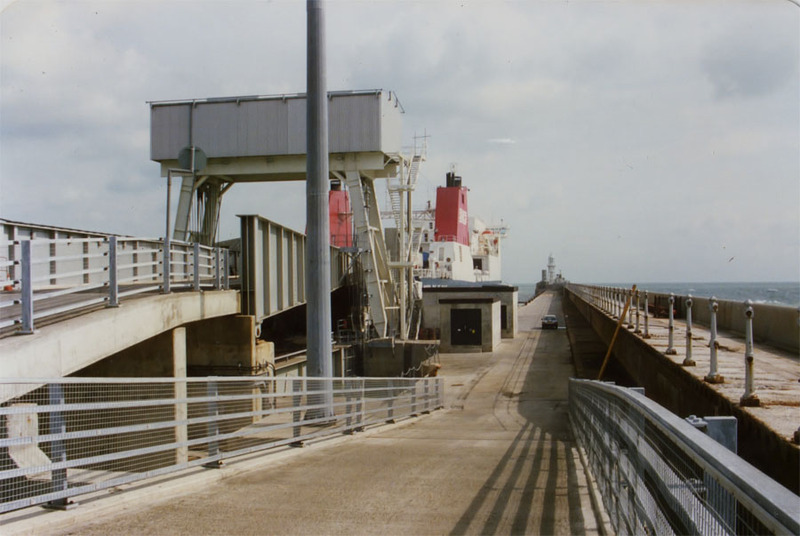 Following the delays in construction caused by the Great Storm of October 1987 the NORD PAS DE CALAIS finally commenced service from the new berth on May 9th 1988. The massive investment by the Port, SNCF and British Rail was to prove it’s worth when figures were released indicated that the new service had handled a record 1,080,623 tonnes of rail freight during 1988, the first time in the route’s 53-year history the rail borne freight had topped the one million mark. On the 6th May 1994 the Channel Tunnel was officially opened (one year later than originally planned), by Queen Elizabeth II and the French president, François Mitterrand, in a ceremony held in Calais. 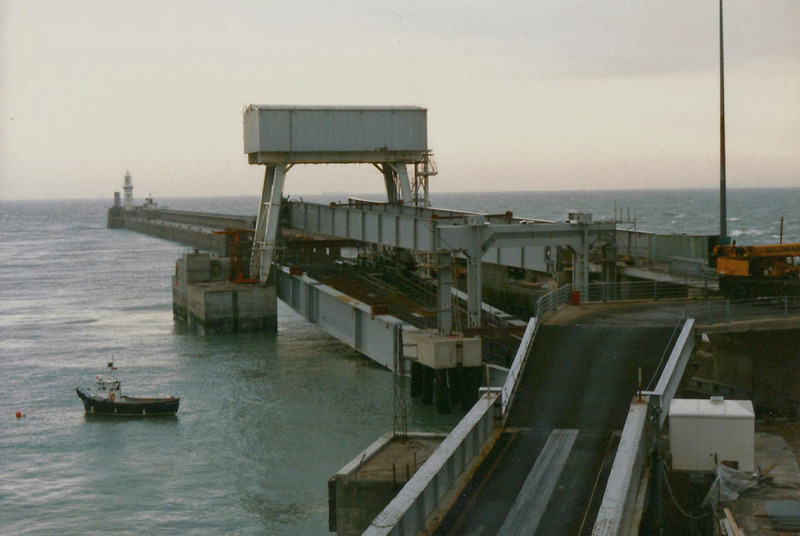 Many thought that with the Tunnel now open and rail freight potentially able to travel directly between the two countries that train ferry operations between Dover and Dunkerque would close immediately, however this wasn’t the case. There were a number of products classed as ‘Dangerous Goods’ (DG) which could not be conveyed through the tunnel which were still shipped via the traditional service. The stay of execution was however only to be brief with the service closing on December 22nd 1995. 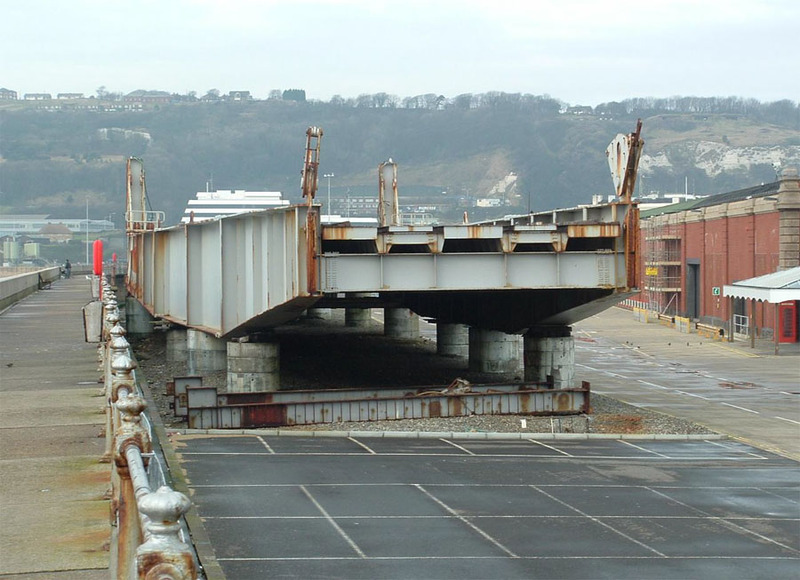 With the service now closed the Port of Dover decided to remove the linkspan bridges and place them on the Admiralty pier in ‘storage’ just in case services were to resume in the future. 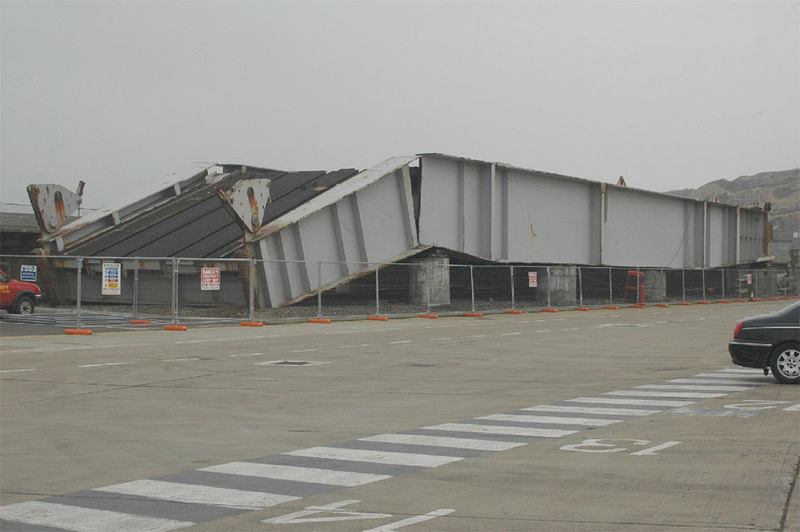 With no resumption in sight and with the area now required for car parking at Dover’s new Cruise Terminal (the former Dover Marine Station which closed in 1994) the linkspan bridges were cut up on site and sold for their recyclable metal value. 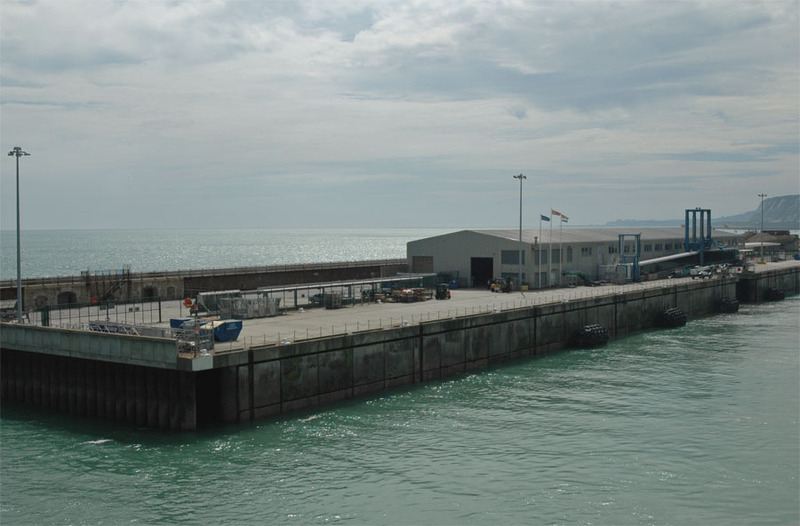 Following the successful conversion of the former Dover Marine Station in 1994/5 to become Dover’s first dedicated cruise terminal the Port of Dover decided to construct a second cruise terminal on the Admiralty pier extension in the location previously occupied by the Train Ferry berth. Opened in the year 2000 Cruise Terminal Two completely covers the area previously occupied by the berth. 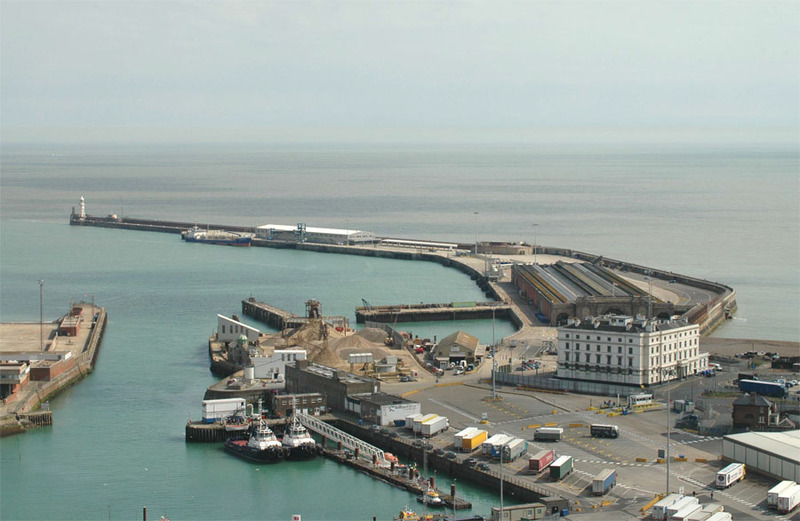 This area of the Port will soon see further extensive development as a part of the Dover Western Docks Revival (DWDR) project. All information is believed to be correct and no responsibility is accepted for any errors or omissions found. All items included in this article are subject to © copyright. We would like to take this opportunity of thanking: Ken Larwood and Ian Lillford for their assistance in compiling this feature. 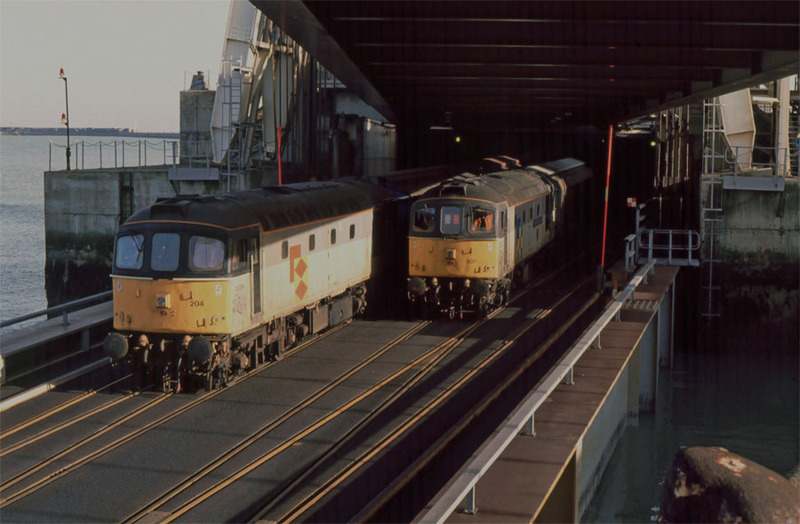 Article © Nigel Thornton and Ray Goodfellow (Dover Ferry Photos Group). All photographs featured are from the Roy Thornton Collection unless otherwise stated. A fantastic page full of history and superb photos. My interest as a railwayman is in the rail vehicles which actually travelled across the channel as I saw many of them during my years as a relief signalman in West London in the 80’s. The photos of the new link span answer many questions and it was good to see class 33/2 locos on it (a favourite class of mine). Thank you gentlemen. 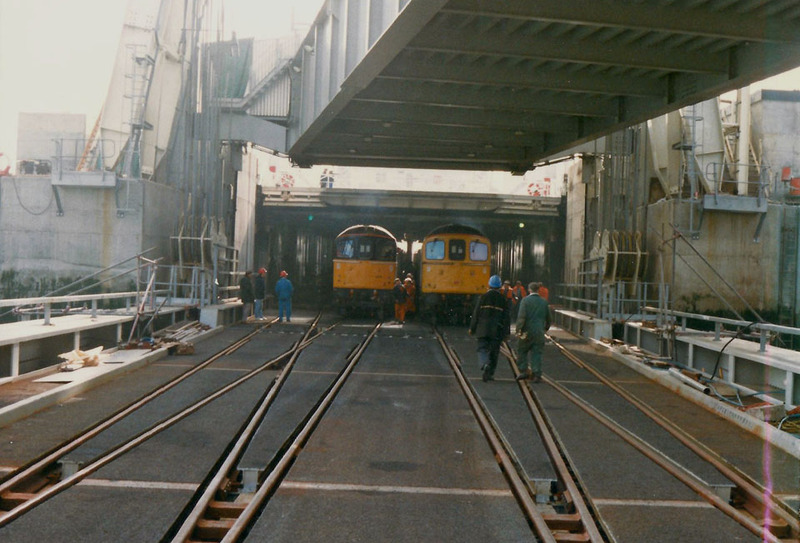 Fascinating website, and full of nostalgia for me (worked at Dover 1966 to 1974), article on Train Ferry brilliant – thank you!